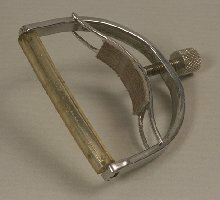 Capos of this type are first seen in the late 1700's. They are still going strong. 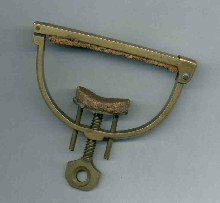 This capo is from around 1840. Leather pads on the bar and protection plate, are fastened with rivets. This is the oldest capo in my collection. Very similar to the capo above. Leather pads fastened with rivets. The pad on the plate is missing. 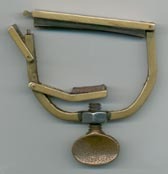 Capo from around 1900. Now the pads are glued to the capo. The leather pads are not original. 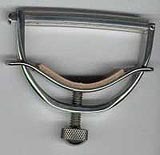 Another similar capo from around 1920. The cork pads glued to the bar and plate are probably not original. Unknown capo from the 1960's. Brass with cork padding. 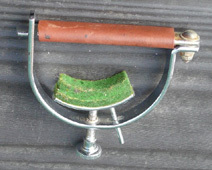 Compare it with the C-clamp from the same period. The screw arrangements are identical. Banjocapo made in 1978 by Olle Larsson. Bronze. The yoke is made out of a ring. The screw and button is made in one piece. Pad and neck protection are made of cloth. The protection plate is not riveted to the screw. To keep it from falling out, the guide pins are slightly spread. A variation from the 1950's. Easier manufacturing by making the bar turn sideways. Black rubber tubing. Made by Krauth & Benninghofen Co, USA. 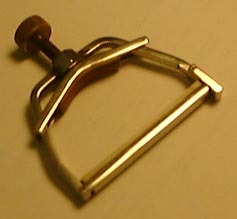 The same yoke and bar is also used on a spring action capo made by the same manufacturer. 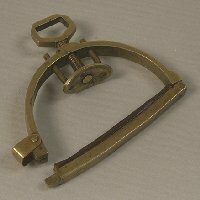 Another similar Hamilton type capo. Transparent plastic tubing and a flat screw head. This one from the late sixties is marked ROLIF B&M. The broken rivet is replaced with a screw and the felt pad is modified. The rubber tubing seems to be original tough. 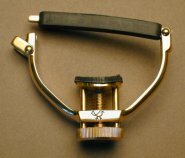 Leno started making a capo for resophonic guitars. The production stopped in the mid 1990's for a couple of years. Now they are back again, also making guitar and banjo capos. A trademark is the buckle to open and close the capo. Marketed by Leno Capo & Guitar Company. Here is an extreme capo. 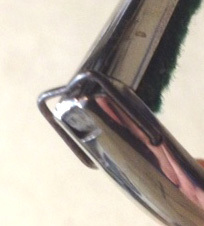 In order to preserve tone and tuning, the bar has a bone edge. The idea is to line up the bone edge exactly with the top of the fret, not bending the strings over the fret. Instead the strings are bent over the bone edge on their way up to the bridge, making the capo work as a nut. Behind the bone edge there is a soft, slightly thicker rubber pad to mute the strings and keep them in place. 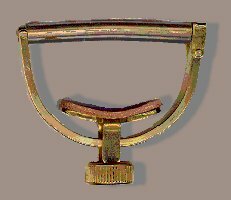 They were made of brass initially and this is the only yoke capo where the protection plate is hinged on the side of the yoke. Later they were made of stainless steel with a brass screw. The steel capos were slimmer. John Holman, USA, made these capos for about a year or two. They had to be fitted precisely to the individual instrument and they were sensitive to fret wear. That is probably why they didn't make it commercially. Designed by Thomas H McKinney III. 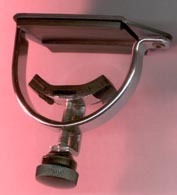 An early McKinney capo, made from 1976 to 1985 when it was replaced by a new design (see below). 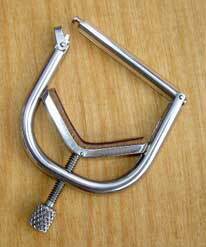 Kyser made this type of capo out of aluminum for a while and called it ELITE. ...and here the ends of the protection plate pass through slots in the yoke. US Patent 1992 by Bryan R Paige. Paige has a clever solution for the 12-stringed guitar. Four small pieces of tubing takes care of the thin octave strings. Here the yoke passes through oval holes in the protection plate. For quick installation and removal a spring-loaded button is installed in the end of the crossbar. The underside of this button is contoured to fit into a slot in the top end of the yoke. This capo is beautifully crafted and made of stainless steel. 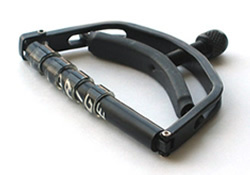 Designed and made by Phil Elliott, Elliott Capos, USA. The yoke and bar on this stainless steel capo is made from round stock. The neck protection plate is guided in grooves inside the yoke. This makes the plate more stable and the outside of the bar is kept smooth. The idea of the V-shape is to make the capo more stable due to two points of contact on the back of the neck rather than one. 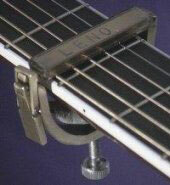 It also helps lining up the capo parallell to the fret and it protects the neck if the screw should wear through. Designed and marketed by Mike Smith, Kat Eyz, USA. 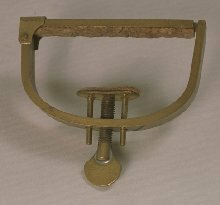 The protection plate has an extension bent around the yoke to rest upon the thumbscrew. This unloads the protection plate from the pressure of the screw. This one has a spring bar to adjust to curved fretboards. No patent. Made by Hamilton Stands Inc, USA. This is an extreme capo. The very wide bar spans over the frets, preventing the strings from being pressed down too far. It clamps the strings against the frets instead of stretching them against the fretboard. Retuning is eliminated and clamping force is minimized. It works effectively but was not a commercial success because of its cumbersome size. The Fretspanner was designed around 1980 by Wayne Clyburn, Kentucky, who donated one to the Capomuseum. The two steering pins are extended all the way down to a groove in the head of the thumbscrew, giving support to the protection plate. Design 1981 by Terumi Nakamoto, Japan. 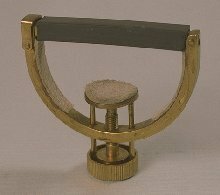 Here the two pins are fastened both in the protection plate and to a circular plate that rests on the head of the thumbscrew. This eliminates the need to fasten the screw in the plate. First rate craftsmanship. Made by Vladislav Ptacek, Czech Republic. Since about 1997 this capo is also marketed under another name. The only difference is the tubing. Same maker. A beautiful crafted capo made of stainless steel. 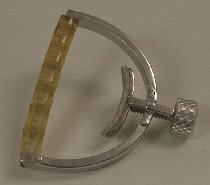 The bent down plate extension passes through a small yoke on one side to rest upon the thumbscrew. US design 1985 by Thomas H McKinney III. When McKinney stopped making his capo, Daniel Smith made it for a couple of years. Around 1993 production was continued by Bill Stokes. Now the capo is made by Phill Elliott - Elliott Capos. The support is further simplified to a pair of bent down extensions on opposite sides of the yoke. It is really a copy of the capo that the English inveterate tinkerer Henry Gustave Melville-Pearse made for his eight year old grandson, John. Made in US by John Pearse� Strings. Plastic capo. 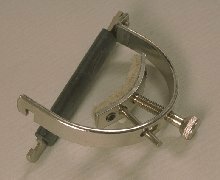 The screw is fastened upside-down in the neck protection, and the capo is tightened by turning a large nut seated in the yoke. Extensions from the neck protection runs in grooves inside the yoke. Note the locking slot at the end of the bar. Made by Nacano Co Ltd, Japan. 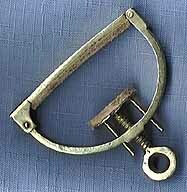 Here is a homemade capo. A Teflon cap on the end of the screw protects the neck. The bar is a thin stainless steel tube covered with a silicon rubber varnish. 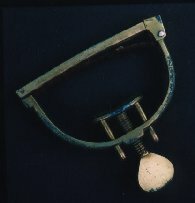 The locking stick is made out off a bicycle spoke and sticks through holes in the yoke and through the bar. The inside of the yoke is covered with foam rubber. Made in 1987 by Iorgulescu Radu, Roumania. This may also be a homemade capo, although machined by a skilled craftsman. Made of stinless steal. Note how the little springy clasp fits smoothly over the end corner of the bar! Owned by Anthony Howell, USA. 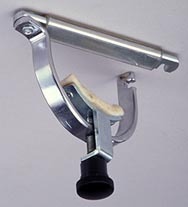 The yoke capo can be simplified by using a nut instead of a screw. 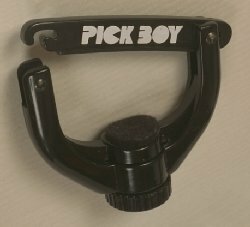 I came up with this idea for a capo in 1995. I made one for my own use and thought the idea of using a nut for adjustment was very cool. 1) The yoke capo could be simplified. 2) The fastening means were placed out of the way for the fretting hand. 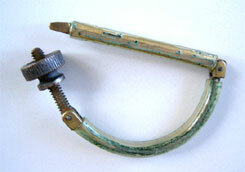 3) The thread length inside the nut would be much longer than in a threaded hole though the yoke. Worn out threads is a common problem with yoke capos. 4) The capo could be snapped open and be removed very fast. 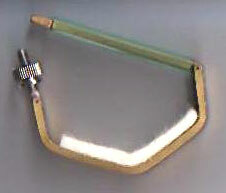 Made of brass with plastic tubing around the bar and the yoke. Tetsuo Koyama from Japan has came up with exactly the same idea! The only difference is the felt pad to protect the back of the neck and the shape of the yoke. Based on the nut idea, I made this capo in 1996. The idea was to simplify it further by using as few parts as possible. It has only three metal parts. The yoke is riveted in one end and the bar is kept from sliding down by the plastic tubing around the yoke. The other end of the yoke is threaded. 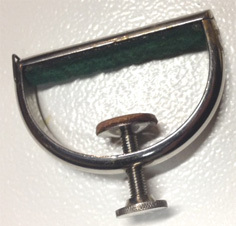 This capo was intended to be kept permanently on the guitar neck and stored above the nut when not in use. 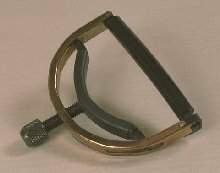 Later I found out that a capo like this was patented as early as 1892 by Volkmar T Johnsen, USA. as possible, I came up with the idea of my life: The Sterner Eccentric Capo.